Nissan X-Trail 2010 is an excellent representative of the class of SUVs. Ideal for long journeys for any distance. Thanks to the excellent quality and ideal pricing, Nissan has created one of the best SUVs that are especially popular among many car enthusiasts. Despite all its advantages, the car is not new, so there are quite a few problems associated with its functionality. Appeals to the official is a guarantee of unnecessary costs that will not give the good result. Company SMARTY Trend will help you improve your car today! Thanks to the Android OS, you can absolutely any application that is Google Play Market and not only. SMARTY Trend receivers are equipped with a powerful processor that provides fast application speed regardless of applications. It can be not only applications to which we have all been used to for a long time, there are quite a lot of programs for cars, most of which are freely available. 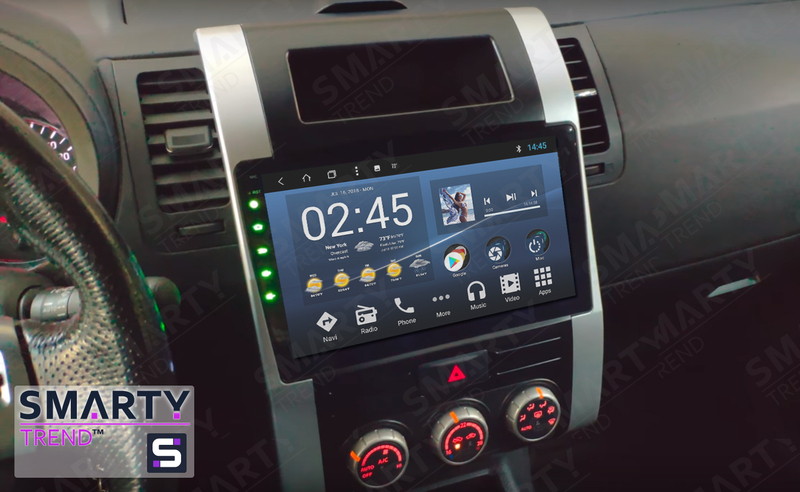 This receiver SMARTY Trend is standard, that is, it was specially designed for this car with all the design features. Including support for regular functions are no exception. Namely, rear view camera, steering buttons, climate control and parking sensors will work in normal mode. Excellent technical characteristics of the head unit will ensure stable operation not only of the standard functions, but also of the car as a whole. For many car owners, quality is a key issue when choosing a head unit. SMARTY Trend is a German brand that is very popular around the world. The quality of materials used and advanced technologies allow you to use modern functionality in your car today. Dual quality control is one of the most important advantages of the SMARTY Trend device. Despite the fact that this car produced in 2010, after replacing the radio, it is not inferior to the cars of the latest model range. The simplicity of working with the SMARTY Trend head unit and the ability to customize it to your liking can’t be compared with any standard system. Regardless of whether it is a navigation system or interface setting. Use the technologies of the future today, SMARTY Trend is always happy to help.